Visiting Eisenberg and looking to get a place to swim? Nice choice! Don't forget to tell us how did it go. 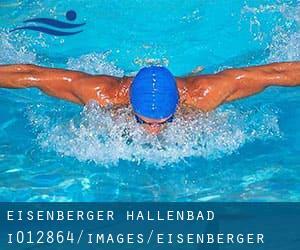 Introducing now Eisenberger Hallenbad swimming pool, a great swimming pool sent by a swimmer like you few days ago. Have you visit this pool? Do you function here? Please, contact us if you have information that you feel is gonna be beneficial and remember from now on you possibly can now promote every pool just by sharing this page together with your friends or adding comments in the Facebook boxes below. Come on and help this pool to be the first in Eisenberg! Among all the activities offered by the center, if you are interested in swimming you will take pleasure in 25 meters, 5 lanes, Indoors. Just in case you would like to get in touch with this Swimming Pool before dropping by, we only know the phone number. Updated on 2019 Marktstraße 3 , Neuhaus am Rennweg , GERMANY (Postal Code: 98724). Among all the activities offered by the center, in case you are considering swimming you will appreciate 25 meters, 4 lanes, Indoors. If you need to contact this Swimming Pool, email address and phone number are both number. Updated on 2019 Schwimmbadweg 10 , Tabarz , GERMANY (Postal Code: 99891). Swimmers like you reported 25 meters, 4 lanes, Indoors. Phone number and e-mail address are number for this Swimming Pool. Updated on 2019 Werdauer Straße 11 , Greiz , GERMANY (Postal Code: 07973). Swimmers like you reported 25 meters x 10 meters, 4 lanes, 1.9 meters depth, 1.9 meters depth, Indoors. Phone number and e-mail address are number for this Swimming Pool. Updated on 2019 Karl-Schwarz-Straße 12 , Gotha , GERMANY (Postal Code: 99867). Among all the activities offered by the center, if you are enthusiastic about swimming you will appreciate 25 meters, 5 lanes, Indoors. If you need to contact this Swimming Pool, email address and phone number are both number. Updated on 2019 Hofwiesenpark 2 , Gera , GERMANY (Postal Code: 7548). This sports center offers Olympic size x 20 meters, 8 lanes, 1.8 meters depth, 1.8 meters depth, Indoors. Contact information for this Swimming Pool such as phone number and email address are number. Updated on 2019 Am Bad 1 , Brotterode , GERMANY (Postal Code: 98599). This sports center offers 25 meters, 4 lanes, Indoors. Contact information for this Swimming Pool such as phone number and email address are number. Updated on 2019 Leutloffstraße 1a , Apolda , GERMANY (Postal Code: 99510). This sports center gives 25 meters x 12.5 meters, Indoors. For this Pool, only phone number is number here. Updated on 2019 Johann-Sebastian-Bach Straße 4 , Erfurt , GERMANY (Postal Code: 99096). This sports center gives Olympic size, 8 lanes, 1.8 meters depth, 1.8 meters depth, Indoors. For this Swimming Pool, only phone number is number here. Updated on 2019 Friedrich-König-Straße 7 , Suhl , GERMANY (Postal Code: 98527). This sports center offers Olympic size, Indoors. Contact information for this Swimming Pool such as phone number and email address are number. Updated on 2019 Kelzstraße 29 , Saalfeld , GERMANY (Postal Code: 07318). This sports center gives 25 meters, 5 lanes, Indoors. Contact information for this Swimming Pool such as phone number and email address are number. Updated on 2019 In der Leineaue 1 , Heilbad Heiligenstadt , GERMANY (Postal Code: 37308). Among all the activities offered by the center, if you are interested in swimming you are going to take pleasure in 25 meters, 4 lanes, Indoors. If you might want to get in touch with this Swimming Pool, email address and phone number are both number. Updated on 2019 Hugo-Trinckler-Strasse 6 , Rudolstadt , GERMANY (Postal Code: 7407). Swimmers like you reported 25 meters, 5 lanes, Indoors. Phone number and e-mail address are number for this Swimming Pool. Updated on 2019 Lindenbühl 10 , Muehlhausen , GERMANY (Postal Code: 99974). This sports center offers 35 meters x 12.5 meters, 5 lanes, Indoors. Contact information for this Swimming Pool including phone number and e-mail address are number. Updated on 2019 Rohrer Stirn 1 , Meiningen , GERMANY. Swimmers like you reported 25 meters, 5 lanes, 1.8 meters depth, 1.8 meters depth, Indoors. Unfortunately we do not have the email address of this Pool, but we can give you the phone number. Updated on 2019 Hermann-Brill-Platz 2 , Weimar , GERMANY (Postal Code: 99423). Among all of the activities offered by the center, if you are interested in swimming you will enjoy 25 meters, 5 lanes, 1.8 meters depth, 1.8 meters depth, Indoors. Just in case you would like to contact this Swimming Pool before dropping by, we only know the phone number.